With the NFL’s 2011-2012 regular season nearly halfway to it’s conclusion, there has already been many surprises and disappointments. The following list will applaud the teams who have surprised the NFL with their play, as well as call out the teams who have not met pre-season expectations. Three years removed from their abysmal 0-16 season, the Detroit Lions have re-surged into one of the NFL’s most dominant teams. Riding on the backs of dynamic duo Matthew Stafford and Calvin Johnson on the offensive side, and the physically intimidating D-Line led by Ndamukung Suh, the Lions started their season 5-0 for the first time since their 1985 campaign. The aforementioned Calvin Johnson, A.K.A. Megatron, had an astounding ten touchdown receptions in his first five games, and is on pace to shatter every one of Jerry Rice’s season records. While Megatron’s sheer athletic dominance is a large part of his success, third-year quarterback Matt Stafford deserves much credit, as well. Since entering the NFL, Stafford has always been a great QB. His setback, however, is his inability to remain healthy. This year, however, he has played every snap, and if he can continue to stay on the field and make great passes, you will definitely hear from the young Lions come January. Team often mimic, in a sense, the attitude and emotions of their coach. This couldn’t be more true for the San Francisco 49ers. Led by head coach Jim Harboagh, whose resume consists of molding future number-one pick, Andrew Luck of Stanford, the 49ers have a peculiar bravado about them. Harbough comes from a long lineage of football players. His father, Jack, played and coached college football. His brother, John, is the current coach of the Baltimore Ravens. Jim, himself, played in the NFL for 15 years before coaching. He is a player’s coach and wears his emotions on his sleeve, and that is exactly why this team is successful. Quarterback Alex Smith is not exactly a future hall-of-famer, but he has been properly managed by Harbaugh, and, as a result, he has had, so far, the best season of his career. Halfback Frank Gore is the real catalyst of this team, however, and is playing like the top-tier player he is. Another contributing factor to this team’s success is their physical, in-your-face, defense that is only allowing 74.7 rushing yards per game(second best in the leauge). Also, because they are playing in the NFL’s weakest divsion, the 49ers are practically a lock for the playoffs. How well the 49ers will stack up against the top teams come playoff time still remains to be seen. 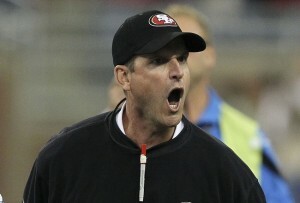 One thing is for sure, though; don’t expect Jim Harbaugh to apologize for hurting your hand after the game. The Buffalo Bills came out of the gates strong, winning their first two games by a total of 37 points. What really set the Bills over the top, however, was their huge win against their division rival, the New England Patriots. The two games the Bills have lost this season were by a total of just six points. Quarterback Ryan Fitzpatrick simply does not make many mistakes. Fitzpatrick won’t throw many huge passes down the field, but he will nickle and dime the defense all the way into the red-zone, and finish them from there. 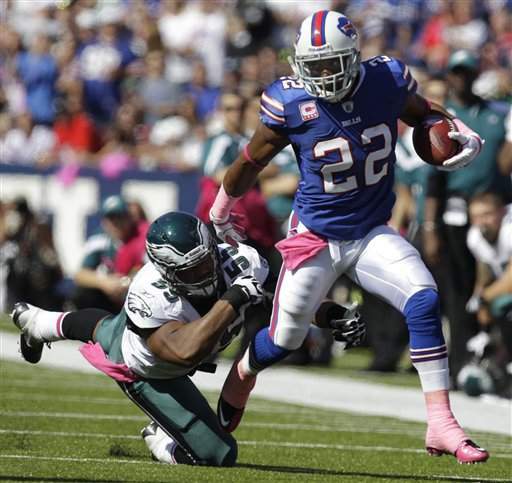 The Bills real home-run-hitter is halfback, Fred Jackson. Jackson has emerged as the feature back for the Bills, as he his the fifth-leading rusher in the NFL. The Buffalo offense is very surgical and methodical, but they put up a lot of points, which makes up for their mediocre defense. More than likely, the Bills won’t win their division, but they will certainly make a bid for the AFC Wild Card spot, and they’re a team no one wants to play against. The Cincinnati Bengals experienced the worst off-season out of all 32 teams last spring. 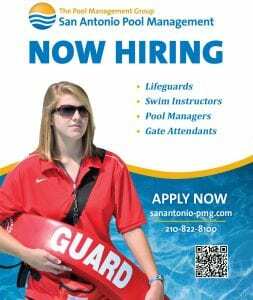 Their long-time starting quarterback, Carson Palmer, demanded a trade, threatening to retire if that request was not granted (Palmer was recently traded to the Raiders for a 2012 first-round draft pick and a conditional 2012 first-round pick). The Bengals also got rid of their top two receivers, Terrell Owens (released) and Chad Ochocinco (traded to the Patriots). The Bengals were clearly rebuilding for the future, as they drafted college phenoms, receiver A.J. Green, and quarterback Andy Dalton. Needless to say, expectations weren’t very high for this team. It turns out, however, the Dalton and Green make quite the duo. 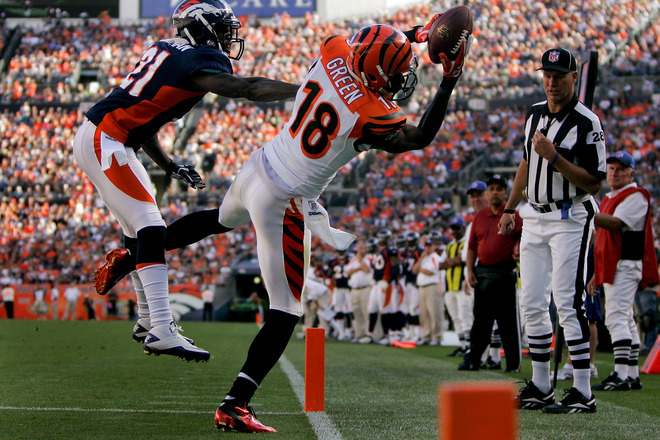 Green leads all rookies in receptions, receiving yards, and touchdowns. Dalton leads all rookies in completion percentage and passer rating. The Bengals also have the number one defense in the NFL. No, that was not a misprint. The Bengals are allowing only 278.5 yards per game. However, because the Bengals are in perhaps the toughest division in the NFL, with the likes of the Steelers and the Ravens, they are unlikely to compete for a playoff bid. Keep your eye on this team, though, they will only get better. While the Cincinnati Bengals had the worst off-season, it is well noted that the Eagles had the best off-season. Signing super free agents, Nnamdi Asomugha, Cullen Jenkins, Jason Babin,Vince Young, and Ronnie Brown, the Eagles were ludicrously dubbed, “The Dream Team”. Well that dream has certainly turned into a nightmare for Philly. After winning their season opener against the pedestrian Rams, the Eagles lost their next four games. The Eagle’s problem isn’t their talent level, as they probably have the most talented roster in the league, their problem is that that talent is not evenly distributed. 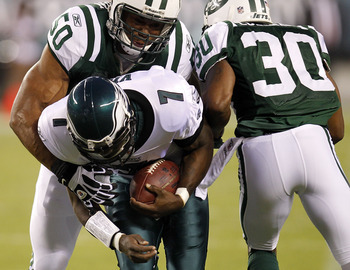 Their offensive line is awful, forcing quarterback Michael Vick to scramble out of the pocket even earlier than normal. Their linebackers are even worse, the best linebacker on that team is rookie Casey Matthews(sorry, Casey, that’s not a compliment). The Eagles were one of the pre-season’s favorites to win the Super Bowl. At this rate, Philidelphia will be lucky to contend for the Wild Card. 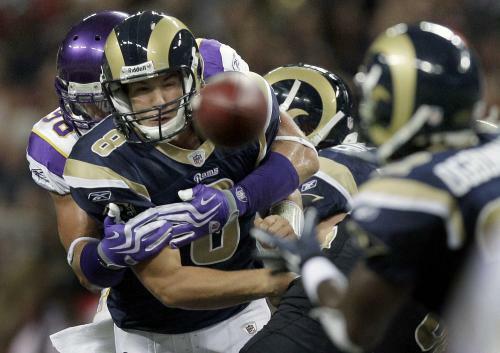 The St. Louis Rams have supposedly been on the rise the past few years. There is no denying that there is talent on this team, with the likes of young quarterback Sam Bradford, veteran halfback Steven Jackson, and recently acquired receiver Brandon Lloyd, but things just don’t ever look like they’re clicking for this team. Bradford just never looks comfortable behind his terrible offensive line(whom cannot block for Steven Jackson), and he is currently throwing for a miserable 53% completion rate and an awful 72 passer rating. The Rams couldn’t stop a high school offense at this point, allowing over 183 rushing yards per game (Cowboys rookie halfback DeMarco Murray recently rushed for a record-setting 253 yards) and their passing defense isn’t fairing much better. The Rams can’t score effeciently and certainly can’t stop anyone from scoring, and that’s obviously not a winning formula. This was supposed to be the year the Rams won their division, but it’s obviously not gelling in St. Louis. It appears as if the long, successful-yet-disappointing, career of quarterback Donovan McNabb will come to an end on the bench in snowy Minnesota. 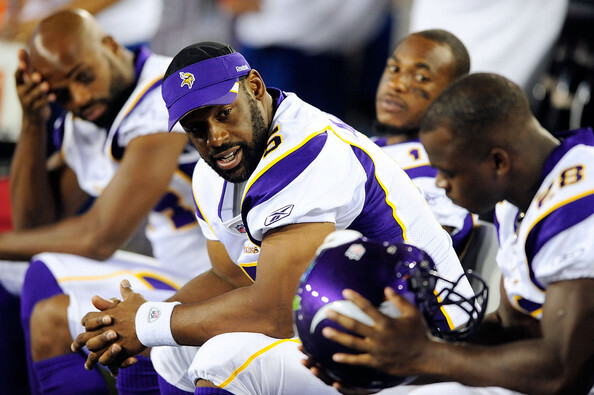 McNabb was traded from the Redskins to the Minnesota during the off-season, and expectations were relatively high for the Vikings. With the NFL’s best halfback, Adrian Peterson, an excellent defensive line, anchored by Jared Allen, and emerging receiver Percy Harvin, Donovan was seen as the missing piece in the Vikings puzzle. Things just don’t typically go well for McNabb, however. He had trouble connecting with Harvin, and sometimes looked lost on the field. McNabb was benched during the Vikings game against the Bears in week six. First-round draft pick, Christian Ponder, was the man to replace McNabb and actually performed rather well in his first NFL game. Ponder also started last week against the Packers, and almost led the Vikings to a huge upset win, but ultimately lost 33-27. After Brett Favre led the Vikings to the NFC Championship game two years ago, Minnesota has struggled to play in an increasingly difficult division. It’s sad to see as good of a person as Donovan McNabb struggle to reclaim his career, but Minnesota just wasn’t a good fit for him. Hey, I'm Michael and I'm a senior at Macarthur. I really enjoy watching, reading, and writing sports. I am also a huge fan of everything entertainment. Movies, TV, books, video games - you name it. If you have any questions or comments about my stories, feel free to leave a comment!